Customising education is still a big pain for schools and teachers. sCool Suite is a collection of tools that deals with this problem. Using applications like sCool Plan, sCool Projects and sCool Folio, pupils, teachers and parents are connected to personalise the education at schools. At schools with the sCool Suite, students are divided by level, not age, and every one of them has a coach. The coach works together with the kid to set up a new personal development plan (PDP) every six weeks, consisting of a set of Goals that the pupil needs or wants to learn, like “I can count to 10”. Those Goals are divided by Areas (such as Math) and then Topics (like Counting). My job was to design an application that would not only put all the information from these apps in one place, but also facilitate the process of creating a PDP, monitoring each student’s progress (for the teacher and the parent) and even create a new curriculum for a school. 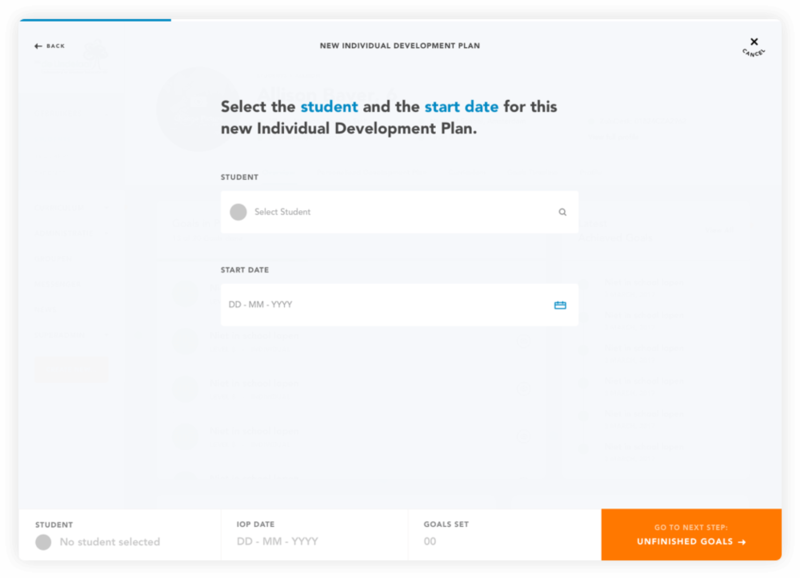 As one of the most important tools of sCool Suite, creating a new Individual Development Plan should be flawless. In only 5 steps, a teacher can create a new IOP according to both the student’s personal needs and the school’s basic curriculum. It is also possible and easy to create a new plan for one or multiple students, adding mandatory or customised goals and even recalling previously not achieved goals. When a teacher has too many students, it's easy to lose track of what each one of them is working on. To help with this struggle, a Goals overview table was created. First, the user sees an overview of Topics by Area, charts and real data help him visualize the status of a Topic considering all of its Goals. The Topic details page includes a table showing the relation of all its Goals and the students that have those goals set. 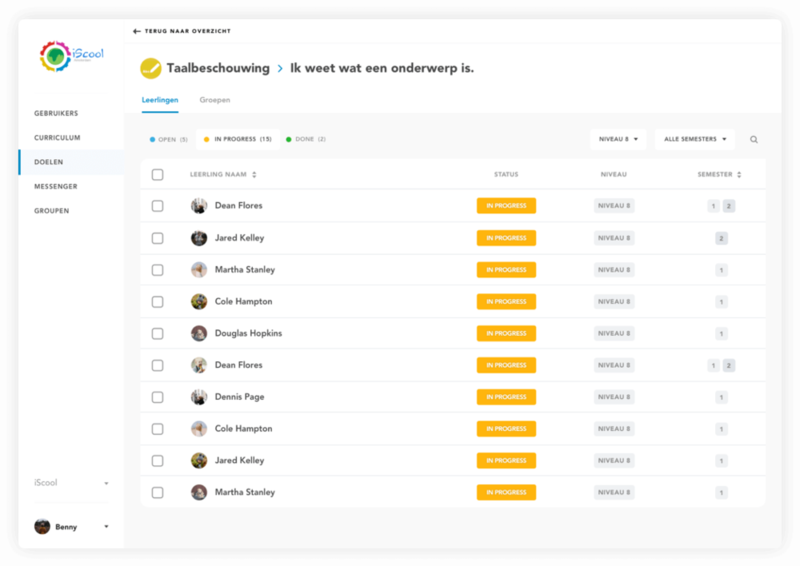 This table uses tags, data and filters to make it easy for teachers to visualize what everyone is doing and then, for example, create a study group, send a message with tips or even edit the goal for all of those students that share it with the same status.